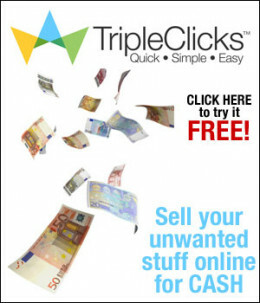 TripleClicks is a great platform to make money online; whether as an affiliate or as a customer. Yet there is confusion on how it actually works and how to use it to your advantage. I am going to clear that up right now for you. First, and foremost, TripleClicks is a store that sells its own products along with products from other vendors. Think of eBay, but easier to use. TripleClicks is very similar to eBay with some major differences that make it easier to sell products. 1. Anyone can sell whatever they want (except things that are NOT allowed to be sold on the Internet – use some common sense). 2. You use what are called TCredits for all services in TripleClicks. A single TCredit will list one item. 3. TripleClicks takes care of all payment processing and has over 40 methods of payment. 4. When an item is listed in TripleClicks, there is no further charge and it will remain listed until it is sold. 5. You can have up to three pictures of your item and 700 words to describe it. 6. You will be notified by email when it is sold and when there is confirmation of delivery – you get paid. People are under the false assumption that the cost to sell items on TripleClicks is higher than eBay; it is not. So why should you care about all this? If you have physical products that you would usually sell on eBay, you can also sell these items at TripleClicks and will probably make more money in the end. 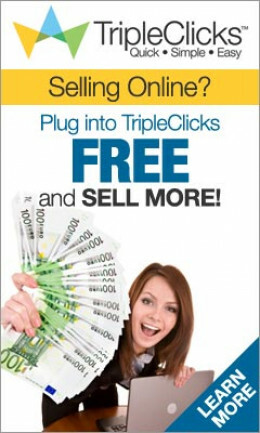 This is the first way to make money with TripleClicks. There is also the PriceBenders Penny Auctions. So how do you make money with a penny auction? Penny auctions use a bid process that raises the final price of the item by one cent for each bid. Each bid will cost you money. The final cost to the winner is the final price plus the cost of how many bids they have used to win the item. You can purchase TCredits for as little as $0.29 each. This makes the PriceBender Penny Auction different as most penny auctions charge a flat rate for bids. For example, QuiBids charges a flat $0.60 per bid. TripleClicks pays for shipping which is unique for a penny auction also. Using a penny auction you can get great deals on brand new items that you can then turn around and re-sell for a good profit. Just as in anything, you need to bid properly to make a profit. Currently, Tripleclicks has added SILVER to the auctions. If you haven’t kept up with precious metals, you need to look at why you should start buying SILVER. The value has been climbing and precious metals are always a good investment. This is the second way to make money with Tripleclicks. 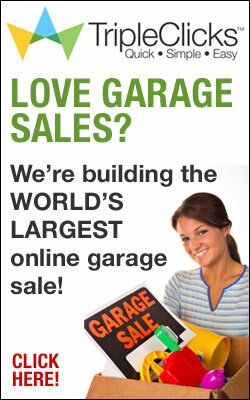 Tripleclicks also has a program that is similar to the eBay power seller store. It is called the ECA program. Using this program, you can create a store of your own within TripleClicks. You list the items and when they sell, you get paid. The major difference is that the TripleClicks ECA program is totally FREE. TripleClicks also rewards its customers in several ways. One if the “Member Rewards Program” (MRP). For each bid you place in the PriceBenders Penny Auction, whether you win or lose, you get 5 MRP points. There is a special member rewards section that you can buy things like iPods, TVs, Stereos, and other really nice stuff using just the MRP points. The great thing is that each bid on PriceBenders isn’t ‘wasted’ or lost since you can use the MRP to buy things. Where else can you do that? You can also use the MRP to purchase other items for a discount. You can also earn 50 MRP points each month by being a part of the Wave3 program. 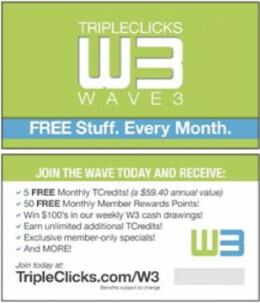 With the Wave3 program, customers are rewarded 50 MRP each month, 5 TCredits each month, and special price exclusives. If you refer a member to Wave3, you get a chance to win the $250 weekly drawing for each person you refer. You also get 50 MRP and 5 TCredits for each person referred. These are all ways to make money with Tripleclicks without being an affiliate or doing anything special. Signing up is free and carries no obligation. You can sign up for getting the “Deal of the Day” newsletter, but that is optional. You won’t get spammed or anything like that. With over 30,000 items for sale (and some of the best natural cleaners I have ever used) you will find something on TripleClicks that will trip your fancy. There a many unique products from all over the world. There are a lot of other very unique things to make TripleClicks a place to explore. If you click the banner below and joinTripleClicks, I will give you a FREE TCredit to use as you want. You can list an item or place a bid in the PriceBender Penny Auction. One bid may not seem like much, but you could win with just one single bid. You can even sell that item you have and make as much as it is worth; so for free you could make some money. Make Money With Triple Clicks Copyright © 2013. Eco Green Sai Gon has a special attraction that make investors as well as people who intend to buy a stable house feel good. What is the highlight of Akari City international design? Sapphira Khang Dien strategically focused on developing the infrastructure of the East Zone when the early investment profit certainly lucrative? Lux Riverview Dat Xanh with strong brand reputation and project evaluation with the positive points will create success? Van phuc riverside is considered a residential lifestyle model with a series of utility class. Du an long hung should invest time to be appropriate for profit? Scitech Tower with regional connectivity and convenient transportation in Ha Noi whether to create market effect?